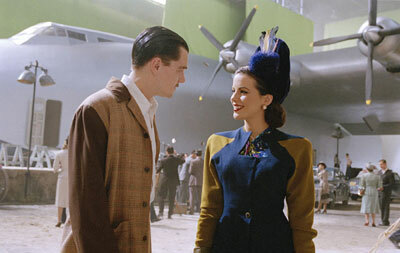 Howard Hughes was a brilliant man who helped society more then we realize sometimes. Though he was known for making violent (and at times smutty) films, Hughes main contribution to society was for his aviation skills. Though he may have intended to make his living as a major Hollywood director, during the filming of his World War II epic “Hell’s Angels” he needed to make the planes move faster for that epic feel he was going for. In a move of keen observation, Hughes ended up with the fastest plain in the world, and he just kept going from there. Though brilliant, Hughes was also a troubled man. Obsessive compulsive and a recluse, Hughes lived the life of glamor and fame, until he died alone with a reputation as an acentric old fool. What attached director Martin Scorsese to Hughes life was, most likely, the troublesome aspects. Scorsese himself went through many of the same problems Hughes went through, though unlike Hughes, it seems Marty was able to overcome them. 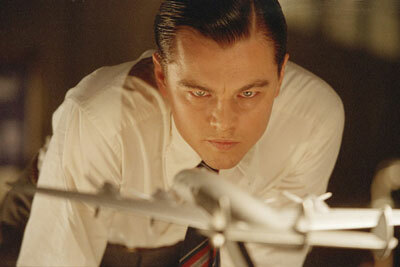 As a sign of deep respect, “The Aviator” downsizes most of the troubles in Hughes life (played by Leonardo DiCaprio in an Oscar nominated role). Though trouble still looms, even the most difficult of times is shown with a hint of glory. Take, for example, a test flight that goes horribly wrong. While in the air for an hour and forty-five minutes Hughes has another great plane on his hands, until something goes wrong with the plain and is crashes into a residential area. The crash is massive, and it leaves Hughes in dire state, but what a disaster it was. If you have to fail, you may as well fail this way. Earlier though, he is a successful movie director, dating several famous film stars, getting into his most serious relationship with Katherine Hepburn (Cate Blanchet, in an Oscar winning role), though this relationship falls apart once Hepburn meets Spencer Tracy. The highlight of his life comes when Pan American Airlines proposes a bill to monopolize aviation, and even buys a politician to help feud a very public battle with Howard Hughes. If it weren’t for Hughes, we’d have another DMV on out hands when it came to flight travel. Though Hughes died lonely and insane, his mark on the world of aviation was important. Even to the end of his life he was talking about jet engines, claiming they were the way of the future. 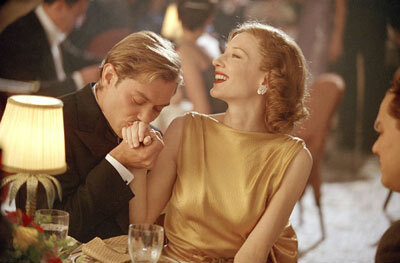 As bio-pics go this is not the most faithful adaptation of Howard Hughes life, but it is the most grand. It has an eye for color, as in the first hour of the film, which is colored in various shades of red and cyan blue to help mimic the two-color Multicolor process (a process Hughes himself owned). The acting is wonderful, fooling even the biggest history buff into suspending disbelief long enough to believe that these are the actual people. Keep an eye out for a slew of cameos playing famous people, with my personal favorite being Jude Laws appearance as Errol Flynn. Though underrated and considered a big indulgence effort on Scorsese’s part, I feel “The Aviator” is one of the directors best, and most personal films. Parents will want to preview this film for language, sexual situations, and a brutal plane crash. Recommended for ages 15 and up.